Background. With the 2020 target year for elimination of lymphatic filariasis (LF) approaching, there is an urgent need to assess how long mass drug administration (MDA) programs with annual ivermectin + albendazole (IA) or diethylcarbamazine + albendazole (DA) would still have to be continued, and how elimination can be accelerated. We addressed this using mathematical modeling. Methods. 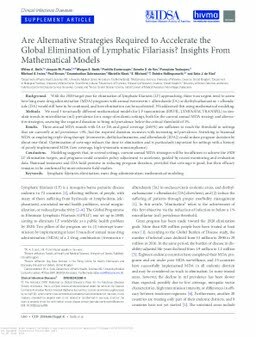 We used 3 structurally different mathematical models for LF transmission (EPIFIL, LYMFASIM, TRANSFIL) to simulate trends in microfilariae (mf) prevalence for a range of endemic settings, both for the current annual MDA strategy and alternative strategies, assessing the required duration to bring mf prevalence below the critical threshold of 1%. Results. Three annual MDA rounds with IA or DA and good coverage (≥65%) are sufficient to reach the threshold in settings that are currently at mf prevalence <4%, but the required duration increases with increasing mf prevalence. Switching to biannual MDA or employing triple-drug therapy (ivermectin, diethylcarbamazine, and albendazole [IDA]) could reduce program duration by about one-third. Optimization of coverage reduces the time to elimination and is particularly important for settings with a history of poorly implemented MDA (low coverage, high systematic noncompliance). Conclusions. Modeling suggests that, in several settings, current annual MDA strategies will be insufficient to achieve the 2020 LF elimination targets, and programs could consider policy adjustment to accelerate, guided by recent monitoring and evaluation data. Biannual treatment and IDA hold promise in reducing program duration, provided that coverage is good, but their efficacy remains to be confirmed by more extensive field studies.